So the king gave the command, and they brought Daniel and cast him into the den of lions. But the king spoke, saying to Daniel, “Your God, whom you serve continually, He will deliver you.” Then a stone was brought and laid on the mouth of the den, and the king sealed it with his own signet ring and with the signets of his lords, that the purpose concerning Daniel might not be changed. Then Daniel said to the king, “O king, live forever! My God sent His angel and shut the lions’ mouths, so that they have not hurt me, because I was found innocent before Him; and also, O king, I have done no wrong before you.” Now the king was exceedingly glad for him, and commanded that they should take Daniel up out of the den. So Daniel was taken up out of the den, and no injury whatever was found on him, because he believed in his God. Like the professional world, the public arena is not an easy place to start from scratch in an effort to become a person of integrity. 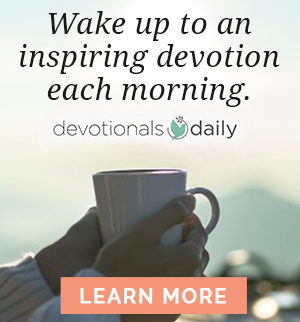 One reason is that, in our culture, like Daniel’s, it is not always true that when we do wrong we will be punished and when we do right we will be rewarded. At times the reverse seems true, challenging our commitment to do what is right. We are about to see how doing right was not rewarded in the case of our friend Daniel. Just when the situation looked hopeless, though, Daniel was delivered from death “because he believed in his God” (Daniel 6:23). What he was in the private, secret place — a committed follower of God — was ultimately revealed in the public square. This was quite a night recorded here for all posterity in Daniel 6 as Daniel found himself the companion of a bunch of hungry lions. He had been thrown into their den, but he slept like a baby right in their midst. The king’s question is the question our culture is asking today: Is our God whom we serve able to deliver us? Daniel had kept his faith in God, a mark of true integrity that is rooted deep in one’s private world. It always follows that integrity is ultimately revealed in the public world for God’s glory and our good. There is a lesson here for us. Daniel was in the lions’ den not because he had done wrong but because he had done right. We all know of people who, like Daniel, have paid a great price for actually doing what was right. But, when all is said and finally done, God — who will never abdicate His throne — will right all wrongs. 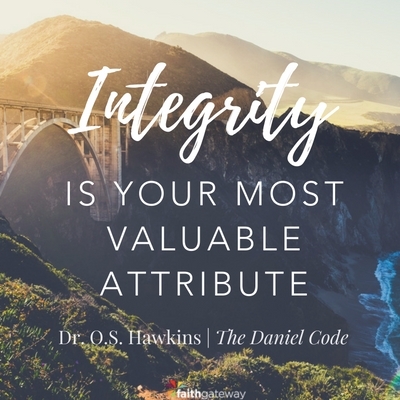 What we see in Daniel’s experience is that, in the final analysis, our integrity will be revealed in the public world as a testimony to our faith and our God. People of integrity do not take personal credit for something they did not do. Even a lost culture will stop and take notice of a person of integrity when that integrity is, sooner or later, revealed in the public world. 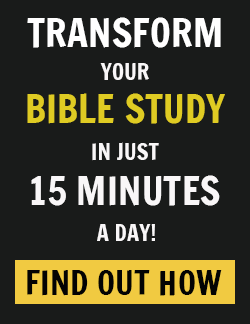 So what do we really learn from Daniel’s experience in the midst of the lions? We learn that our integrity must be rooted in our private life. Prayer should be our number one priority. In Daniel’s own value system, his private time alone with his God was his highest priority. We learn that integrity is reflected in our personal lives. How we respond and react in our personal relationships with those who know us best is directly correlated to the strength of our own private life with the Lord. We also learn that true integrity can always be reinforced in our professional lives. Integrity is crucial in the market- place. Many professing believers are not influencing our culture because their lives Monday through Friday are not that different from the lives of those with whom they work. The best place to engage and transform our culture is not the place where we spend Sunday morning but the place where we spend Monday through Friday of each week. Finally, we learn that integrity will ultimately be revealed in the public life. Everything King Darius knew about God he learned by observing Daniel’s public life of integrity. Think about that. We are being watched, and our world still wants to know, “Is your God able to deliver you?” They will never know unless we are men and women of integrity. Daniel’s God is still our God! Seemingly with every new court decision, our twenty-first-century culture brings new challenges to our Christian values and truth claims. Those of us who once knew a Judeo-Christian culture have suddenly found ourselves living in a culture as hostile to what we believe as Babylon was to Daniel. Our world is evolving into one of massive pluralism with an encroaching paganism attached to various belief systems. Our nation — our culture — is in great need of men and women whose integrity is rooted in their private lives, reflected in their personal lives, reinforced in the professional setting, and revealed in public. May they rise up and be counted! So Daniel has left us his own code for engaging and influencing our culture. It is centered in our personal integrity. And if we are going to find our way through a culture that has lost its way, we can’t leave home without it!